One of the great side effects of spending two weeks drinking cocktails is the opportunity to learn all about the things you never even knew you didn’t know. For example, prior to this odyssey of alcoholic indulgence – f-yeah! – I pictured the golden age of cocktails to be, ironically, the twenties — around the time of prohibition. 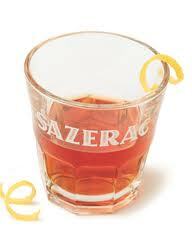 Part of that fantasy might be true, but one could make a strong argument that the true golden age of cocktails came long before prohibition, way back in the mid nineteenth century and a prime example of that era’s supremacy comes in today’s cocktail–the Sazerac.